The course explores who Jesus was, what his aims were, and what it means to follow him today. You will not be asked to sing or read aloud .You can ask any and as many questions as you like. You can just come along and listen if you would prefer. Fill in the form at the bottom of this page if you are interested in joining in the next course, if you can't make the next course fill in the form anyway because your information will help us when we decide when to schedule the next one. 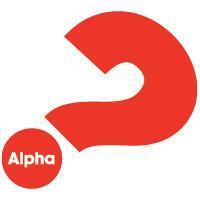 Q Who is Alpha for ? A Anyone who wants to investigate the Christian faith in an informal way with a group of other people. Whether you have previous experience of Church, Christians and the Bible ,or none at all this course is for you. Everyone is welcome. Tell us as little or as much about yourself as you feel comfortable with. Q How many people in the group? A Usually 6-9 people including 2 leaders. Q What goes on ? A It starts usually with a meal. Then we watch a short DVD or listen to a talk for about 30 minutes. Then there is an opportunity for questions and discussion. Q How long does that take? A 2 hours is the maximum time, although there is an opportunity to hang around and talk to people afterwards. Q How long does the course last ? A 7 normal sessions plus a longer one which is normally on a Saturday. Q Can I pull out if I want to? A Of course you can. Q How much does it cost.? A Nothing apart from your time. Q Do I have to bring anything? Q Am I going to get preached at? A No it is not a church service, there is no singing or clapping and you will not be asked to read aloud. We listen to a talk in person or on a DVD designed to explain an aspect of the Christian belief and to stimulate discussion. Hopefully you will find them challenging and maybe amusing. The group leaders will use this to facilitate discussion and try to answer questions. Q Do I have to speak in the group? A Not if you do not want to . You are welcome just to sit and listen. A As Christians we count it as a real privilege to explain the truth and relevance of the Christian message. We do not have all the answers but believe that we have exciting news to share about Jesus Christ. Q How do I get on a course and when is it starting.? A Contact us via email or give us a ring on 01636 815512 or use the form below.